StageLine SL100 or SL50 rentals in Orlando with turnkey service. We have deployed Stageline mobile stages from Miami to Jacksonville. In Orlando we've provided mobile stage rental at all of the theme parks and attractions, at private residences, at the Central Florida Fairgrounds, and even in Downtown Orlando in the middle of city streets. 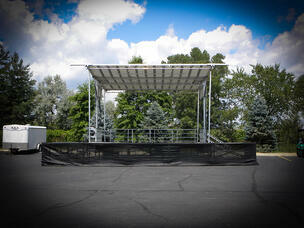 Rent StageRight stage decks from PM1 with "RCID" approved stairs & railings & ADA Access. We're also here to help if you just have questions, aren't sure where to go next, or need design help. No pressure, just questions answered. We service events everywhere in the RCID, the Orange County Convention Center, The Gaylord Resort, high end weddings, corporate events and everything in between. For events over inside RCID, ADA Access is Mandatory. Check out our full line of ADA ramps, Lifts, and Elevators.